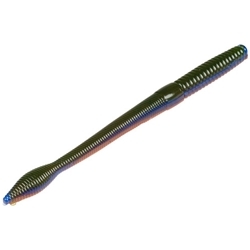 Strike King's 10" Bullworm features a beveled bubble tail and is designed to go big for those giant fish! The soft texture and coffee scent technology cause fish to hold on longer. The Bullworm has a soft texture which is more flexible for better action and enables better hook penetration for a higher hook-ratio.